^ a b c Friedman, U.S. Battleships, p.52. ^ Fairbanks, C The Dreadnought Revolution, International History Review 1991; and Seligmann, M New Weapons for New Targets, International History Review June 2008. ^ Parkes, British Battleships, p.426, quoting an I.N.A. paper of 9 April 1919 by Sir Philip Watts. ^ Gröner, German Warships 1815–1945, Volume One: Major Surface vessels. Axell, Albert et al (2004) (Swedish). Kamikaze - Japans självmordspiloter. Lund, Sweden: Historiska media. pp. 316. ISBN 91-85057-09-6. Brown, D. K. (2003). 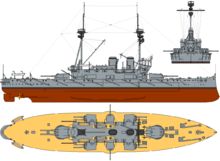 The Grand Fleet: Warship Design and Development 1906–1922. Caxton Editions. pp. 208. ISBN 978-1-84067-531-3. Corbett, Sir Julian (1994). Maritime Operations In The Russo-Japanese War 1904–1905. Naval Institute Press. pp. 1072. ISBN 1-55750-129-7. Originally Classified and in two volumes. Evans, D. and Peattie, M (1997). Kaigun: Strategy, Tactics and Technology in the Imperial Japanese Navy, 1887 1941. Annapolis: Naval Institute Press. ISBN 0-87021-192-7. Gardiner, Robert (Ed.) and Gray, Randal (Author) (1985). 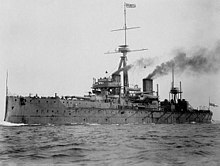 Conway's All the World's Fighting Ships, 1906–1921. Naval Institute Press. pp. 439. ISBN 978-0-87021-907-8. Gardiner, Robert (Ed.) and Lambert, Andrew (Ed.) (2001). Steam, Steel and Shellfire: The steam warship 1815–1905 - Conway's History of the Ship. Book Sales. pp. 192. ISBN 978-0-7858-1413-9. Gibbons, Tony (1983). The Complete Encyclopedia of Battleships and Battlecruisers - A Technical Directory of all the World's Capital Ships from 1860 to the Present Day. London, UK: Salamander Books Ltd. pp. 272. ISBN 0-517-37810-8. Greger, René (1993) (German). Schlachtschiffe der Welt. Stuttgart, Stuttgart: Motorbuch Verlag. pp. 260. ISBN 3-613-01459-9. Gröner, Erich (1990). German Warships 1815–1945 Volume 1. Annapolis, MD: Naval Institute Press. ISBN 0-87021-790-9. Ireland, Bernard and Grove, Eric (1997). Jane's War At Sea 1897–1997. London: Harper Collins Publishers. pp. 256. ISBN 0-00-472065-2. Marder, Arthur J. (1964). The Anatomy of British Sea Power: A History of British Naval Policy in the Pre-Dreadnought Era, 1880–1905. Frank Cass & Co., Ltd.. pp. 580. Massie, Robert (2004). Dreadnought: Britain, Germany and the Coming of the Great War. London: Pimlico. ISBN 978-1-84413-528-8. Massie, Robert (2005). Castles of Steel - Britain, Germany and the Winning of the Great War at Sea. London: Pimlico. ISBN 1-84413-411-3. Sumida, Jon (January 1990). “British Naval Administration and Policy in the Age of Fisher”. The Journal of Military History (Society for Military History) 54 (1): 1–26. doi:10.2307/1985838. Sumida, Jon (October 1995). “Sir John Fisher and the Dreadnought: The Sources of Naval Mythology”. The Journal of Military History (Society for Military History) 59 (4): 619–637. doi:10.2307/2944495.